Aloha! Open our front door to be greeted by the sparkling blue sea before you. Drop your bags and head down to the beach - you've arrived - now relax. You'll find our home wonderfully located, comfortably furnished, and well supplied for your vacation in this warm, welcoming island paradise. Location Location Location! 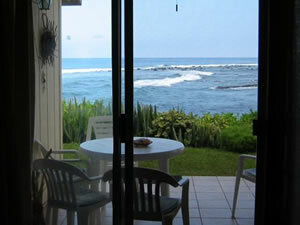 This oceanfront townhouse in Kona Surf & Racquet Club offers incredible sand and sea vistas as well as privacy. 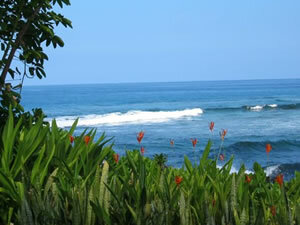 Walk to renowned snorkel beach, shopping, restaurants, golf and more. Spectacular! Watch the moon rise, the sun set and the waves roll in from the queen size master bed. Or turn on the TV/DVD/VCR and catch up on the rest of the world. 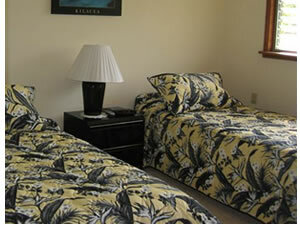 The garden view bedroom has two twins that can be made into a king-size bed; bedding is supplied for this option. There is a television in this room as well. 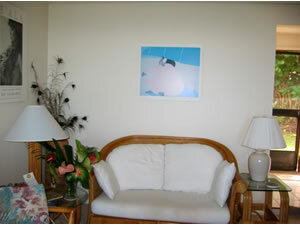 Downstairs, the sleeper sofa enjoys the same fabulous view as the master bedroom. The downstairs TV/DVD/VCR serves this sleeping accomodation. Full bath upstairs with shower over tub. Full bath downstairs has large shower. Fully stocked kitchen including condiments and spices. Excellent assortment of utensils, serveware, plenty of glasses, toaster oven, blender, and coffee maker supplied. There's even an ice chest for picnics. Private lanai and garden for al fresco dining and sunset watching. Just a few steps to the white water of the surf. Look for eels in the rocky pools, stroll along the beach, or pick a spot under the palms to relax with a book. One reserved space and many visitor spaces too. 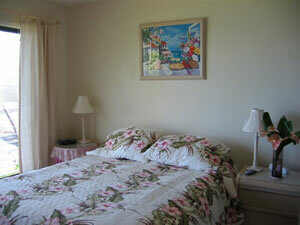 Gated comunity offers tennis courts, large heated pool, pavillion with kitchen and dining/game tables, & outdoor barbeques. Other activities/entertainment: Too much to list....but for starters: short walk Kahalu'u Beach Park for world renowned snorkeling, turtle watching, swimming and sun bathing. One mile to White Sands Beach (aka Magic Sands) a popular surfing and boogie boarding spot. 20 minutes to City of Refuge and Kealakekua Bay for kayaking, sightseeing, picnicing and more world-class snorkeling. Take a day trip to the volcano and hike through ancient lava tubs - or to the lava flow! Stargazing at the observatory at 9000 feet is amazing - you haven't seen stars like these. The botanical gardens are a tribute to the diversity of nature and be sure to check out a couple of orchid farms. Choose from several renowned golf courses. There's parasailing, scuba diving, horse back riding, open-air markets, cultural exhibits, hula shows, music and more happening every day on this enchanting island.